Isaac Chong Wai, Self Portrait: The evening when I was beaten up by a stranger with a glass bottle, 2015. Archival inkjet print 40 x 27 cm. Edition of 5 + 2AP. Courtesy of artist and Blindspot Gallery. 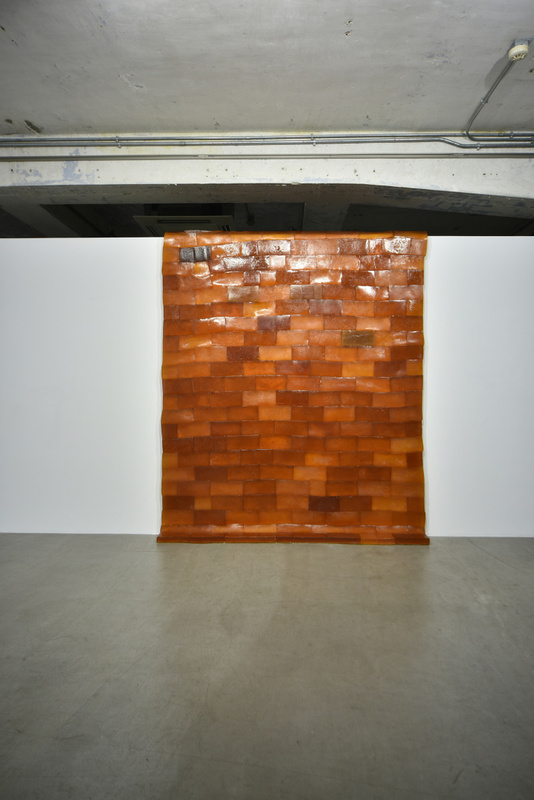 Isaac Chong Wai, Haribo Wall – Gold (Under Construction), 2017 – 2019. Haribo Gummy Bears, 12 x 24 x 5 cm each, installation size variable. Courtesy of artist and Blindspot Gallery. 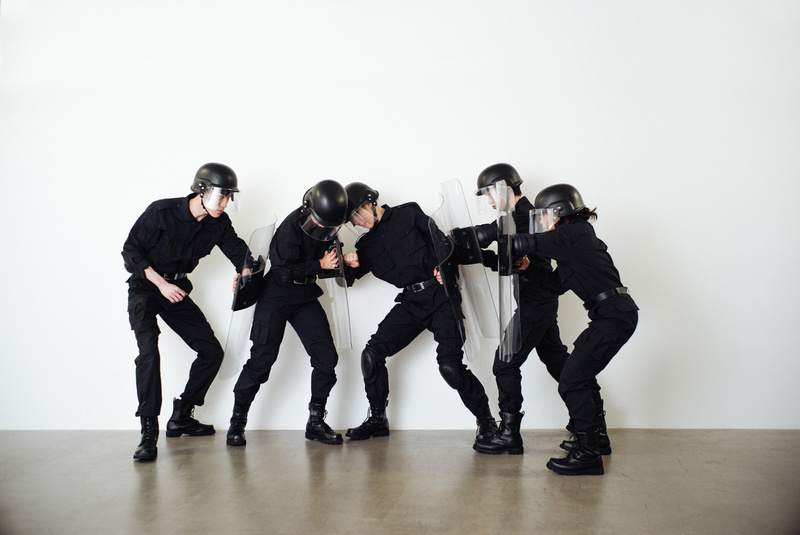 Isaac Chong Wai, Rehearsal of the Futures: Police Training Exercises, 2018. Dual-channel video, 18’02”. Edition of 5 + 2AP. Commissioned by M+ for M+ Live Art: Audience as Performer, 2018. Courtesy of artist and Blindspot Gallery. Isaac Chong Wai, A selfie that celebrated a murder incident in the no man’s land (detail), 2018. Laser etching on optical glass, set of 91 13.8 x 17.8 cm each. Courtesy of artist and Blindspot Gallery. Christie Lee is an arts journalist. Her articles have been published in Frieze, Artsy Editorial, Yishu, Randian, Artomity and The Peak magazine. A graduate of McGill University, she lives in London and Hong Kong. Inspired, and beginning with the artist’s own experience of being physically attacked by a stranger in Berlin, his city of residence, Isaac Chong Wai’s solo exhibition, “Is the World Your Friend?”, contemplates the social and political impacts of incarceration, victimisation, migration and border issues, and oppression. One night in 2015, Isaac Chong Wai was on his way home when suddenly, a man popped out and started verbally harassing him – “he asked whether I was Japanese or Chinese before greeting me with ‘ni hao’, ‘konichiwa’, you know, the usual”. Before he had time to react, the man had gotten uncomfortably close, his hand swinging near the front pocket of his trousers. When the artist finally found his voice and said, “what do you want from me?”, the man picked up a glass bottle and threw it at him. Everything became a blur after: the artist fell to the floor, some strangers helped him up, and a moment later, he found himself recounting the incident at a police station. At the entrance to “Is the World My Friend?”, the artist’s solo exhibition at Blindspot gallery, a certificate ‘proving’ that Chong was a victim of a crime is placed next to a snapshot of the artist’s bruised face. The Berlin-based artist had lifted the title from something that a friend told me. “He told me, ‘the world is not your friend’,” Chong says as we meet at the gallery. “That statement kept resurfacing, but I wanted it to be a question. I’m generally quite positive, but after that incident, I don’t know…” This duplicity, of good cheer and distrust, violence and tenderness, appears to run through most of Chong’s works at Blindspot gallery. It was 2017, and Donald Trump, having won the 2016 US presidential election on anti-immigrant rhetoric, wanted money to build a wall along the US-Mexico border. Some 4160 miles away, Chong was constructing a wall of his own in Berlin. His immediate inspiration though, wasn’t the 2016 elections, but a trip to Sal in Cape Verde, Africa. “I couldn’t find much food that I could eat there, but they had Haribo candies. I was amazed. That got me thinking about mobility of objects – how they might be stronger than a passport.” Upon returning to Berlin, the artist bought 400kg of Haribo gummy bears, (that’s more than 180,000 bears. Yes we counted) melted them and created bricks from the liquid with silicon moulds. The result was a soft, spongy (but fortunately, not gooey) wall that can be draped over a wall, thus supplanting it, and that travels well, defeating the idea of an immobile, impenetrable wall. From afar, it’s hard to tell what the wall was made of, but take a step closer and one can clearly see outlines of Haribo bears in certain parts of the wall. One bear, in particular, does not appear to have melted at all; stuck in the brick, its body is turned away from us, as if trying to pull itself out of purgatory. A perverse joke. Chong says that it’s deliberate – a reminder that Haribo – Gold was conceived from what different nations share, rather than one that divides. While Chong’s recent works is grounded in Euro-American sensibility, the Guangzhou-born, Hong Kong-raised artist’s first examination of borders was in his hometown. In his Equilibrium series, he explored the distance – physical and emotional – among Hong -Kongers. One work comprised a series of 6 black and white photographs of two eyes ‘facing’ each other. Chong might be based in Berlin but heart is still where Hong Kong is. When asked about the inspiration behind Rehearsal of Futures – Is the World Your Friend?, his first response was “protests are still a very precious thing in Hong Kong”. Rehearsal of the Futures – Is the World Your Friend? (2019) is Chong’s investigation into how certain gestures and movements – “people getting arrested, falling, marching” – are repeated throughout history. During the performance on opening night, the artist and a few performers took turns enacting these movements against sounds of protests that he’d collected from YouTube. A twin piece to the similarly wordy Rehearsal of the Futures – Police Training Exercises (2018), where Chong asked ‘how do you arrest someone with gentleness?’ The performance, by slowing down – and distorting – acts of confrontation, appears to be undermining any moralistic objections on the part of the audience, but Chong says Rehearsal of the Futures is ultimately utopian. “The idea of training police to operate in slow motion is quite utopian. I’m not ignoring the fact that the act of hitting someone is there, but if the police doing the same act in slow motion, that means he or she is just touching the other person. For me, this ambiguity is utopian.” Utopian perhaps, is also being able to visit former torture sites without fear. But what exactly, can art do? “Is the World Your Friend?” ends on an ambiguous note. In contrast to I Dated a Guy in Buchenwald, A selfie that celebrated a murder incident in the no man’s land (2019) was inspired by an incident that happened in international waters – a story that belongs to no one, but at the same time, everyone. In 2014, a cellphone was left in a taxi in Fuji. In it was a video of a group of men taking selfies after opening fire on their fellow human beings. The scene was later broadcasted on the internet for the entire world to see. Too important to ignore, too horrific to describe, Chong devised a viewing method where the images – quite literally – come slowly to you. 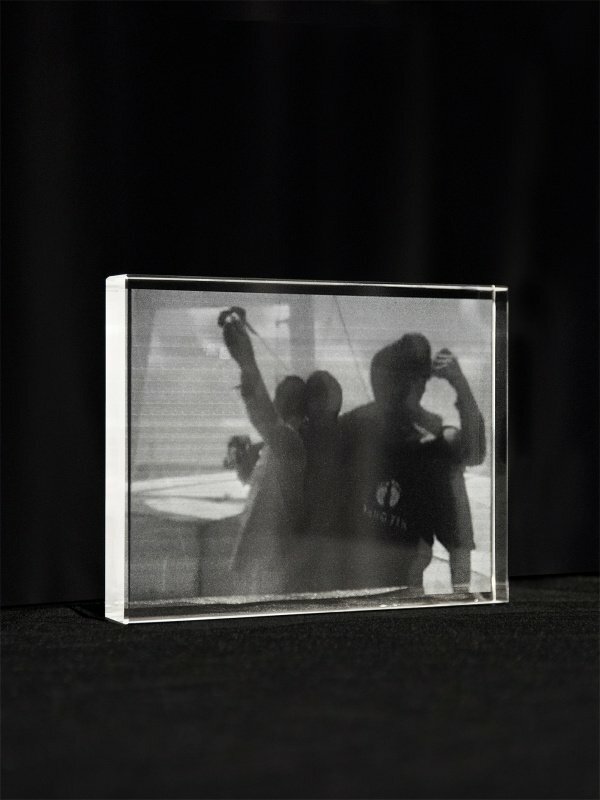 The video was spliced into dozens of frames, each printed on a glass plaque – akin to glass memorials, but also like the plaques handed out at award ceremonies – before being displayed in chronological order. As one slowly down the wall of plaques, one could make out – though barely – the chilling grins of the selfie-taking murderers. Isaac Chong Wai － Is the World Your Friend? 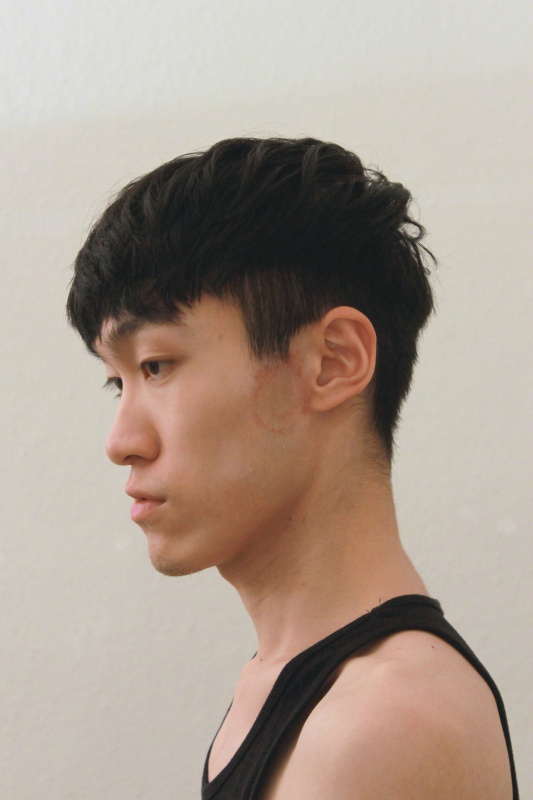 Isaac Chong Wai is a Berlin-based artist from Hong Kong, with an MFA in Public Art and New Artistic Strategies from the Bauhaus-Universität in Weimar, Germany, and a BA in Visual Arts from the Academy of Visual Arts at the Hong Kong Baptist University. His work has been shown at M+ Museum and Para Site in Hong Kong in 2018; Stiftung Brandenburger Tor and Haus der Kulturen der Welt in Berlin in 2017; Deutsche Künstlerbund, Berlin and Gwangju Media Art Festival in 2016; Kunstfest Weimar and Macura Museum in Novi Banovic and the Moscow International Biennale for Young Art in Museum of Moscow in 2014. He had solo exhibitions at Kunstraum München in Munich, 2018, Goethe Institut Hongkong in Hong Kong, 2018, Bauhaus Museum in Weimar, 2016. His works across a range of media, including live performance, video, photography, and site-specific installation, and considers the interplay between the collective and the individual, the politics of time and space, and real and imagined futures. His works often engage with other performers, with whom Chong performs, to allow for further interrogation of notions of the social and unified body. Chong was selected for the Scholarship Künstlerhaus Lukas in 2018. He is one of the participating artists at Urban Heat, a four-year project by the Festivals in Transition Network, supported by Creative Europe from 2015 to 2018. He received first runner-up of the Hong Kong Human Rights Art Prize in 2017. He was awarded the Burger Collection “Artist Scholarship Program” in 2016, and the Bauhaus Essentials Award in 2015 and 2014. He was awarded the first runner-up prize for the Hong Kong Contemporary Art Award and the Professor Eva Man Best Honours Project Award in 2012. His works are collected by Burger Collection.